Coin grading books, guides, and other references summarized here. Several of the best selling coin grading books are reviewed here, without bias. You can access other titles and accessories by clicking the "Coin Grading Resources" button on the upper right hand of this page. Five-Star Rating System Super, top of line, far exceeds expectations. Nothing extraordinary, but worth the money. Sub-par, you'll probably be disappointed. This book builds a solid foundation in coin grading for the new collector, but has little for experienced numismatists seeking to advance their skills. Impressively, all United States coin types are covered, which includes a specific set of photographs and detailed instructions to measure the amount of wear and approximate a grade. Hundreds of B&W photos and a few color, but none taken under high magnification. Grading is more than just looking at wear, and the book touches upon these concepts (e.g. die weakness), but there are no supporting photos, leaving it to the imagination of the reader. Still, the ANA Grading Standards is a building block upon which a collector can reach greater heights. Available from Amazon at a modest price. 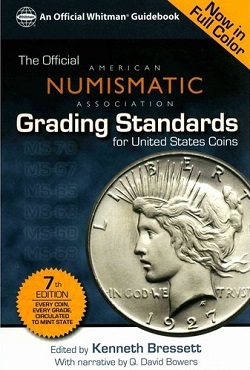 "This comprehensive and easy-to-use guide provides the official American Numismatic Association grading standards for every United States coin minted since 1793. Beginners, advanced collectors, and dealers will all find the text understandable and invaluable for grading coins, both circulation strikes and Proofs. 351 pages softbound." Explains the importance of grade as it relates to coin value. This may seem obvious to collectors that have been around a while, but to the novice, this may be something they've never heard before. Coin grading terminology is laid out on the table. The evolution of grading standards is summarized, starting in 1892, to the Sheldon 70-point scale, the ANACS grading service, changing interpretations, and slabbed coins. -- Getting started with coin grading. -- Characteristics of a coin's surface. -- Marks in the die. -- Striking and die weakness. -- Contact marks and wear. -- Natural coloration of coins. Good information, but there are no photos or illustrations to complement the solid narrative, leaving the reader a bit unsure as to what the book is attempting to describe. Demonstrative visual aids are really called for here. Whoever invented the old saying "a picture is worth a thousand words" may have had a situation like this in mind. Interesting commentary on the topic of overgrading. The history of proof coins is briefly explained, as well as how they are made and graded. Again, no photos to illustrate the basic points. About 85% of the book is devoted to the specifics of grading all US coin types minted since 1793, from Half Cents to Double Eagles (there is a small section on commemoratives tossed in at the very end of the book). Various grade examples, from AG-3 to Mint State, for every coin type is photographed. Arrows point out the location where the first traces of wear occur, both obverse and reverse. This is perhaps the most useful aspect of the book. There are detailed instructions on what is seen in the photos. For example, the obverse of the Standing Liberty Quarter in F-12 condition is described thusly: "Gown details are worn but show clearly across body. Right leg is nearly flat and toe is worn. Breast is worn but some mail is visible. Date may show some weakness at top. rim is full. Outer edge of shield is nearly complete". Using this approach, even a beginner can quickly catch on to the basics of coin grading. There are not many photos of Mint State examples, only written descriptions to differentiate between grades MS-60 through MS-70. The authors relied upon their vast experience in compiling the "Notes" section at the end of every coin type presentation. This information deals with specific characteristic traits to assist in grading and value that are not directly associated with wear. For example, the "Notes" section following Mercury Dimes includes this tidbit: "Coins of this design are sometimes weakly struck in spots, particularly at the facial hair line, and in the lines and horizontal bands of the fasces", and this "1923: Often has the bottom of the 3 weakly struck and joined to the rim." The ANA Grading Standards is easy to use and interpret, as far as learning about and understanding coin wear. Other factors entering into the coin grading equation (e.g. contact marks) are in the book but less obvious to the reader, and are not illustrated. Not enough color photographs. There are 297 pages with photos, but only 16 of these pages have color. In a book devoted to coin grading, one might expect to see many images taken under high magnification, to demonstrate key grading concepts that are more easily visible when enlarged. There are none. There should be photos to mimic what collectors are searching for under a 5x or 10x loupe. There is no index, and with no index, it is more difficult to locate specific subject matter. The Table of Contents is of little help in this regard. (Please note this review was written for the 18th edition of Photograde.) Restricted versatility as a coin grading reference guide, basically limited to assessing condition of circulated coins. To that end, Photograde depicts approximately 1000 black and white coin photos, representing the obverse and reverse of every major United States coin, in grades ranging from About Good (AG-3) to About Uncirculated (AU-50). Very little treatment of Uncirculated or Proof coins. When Photograde first hit the market in 1970, it revolutionized the approach to coin grading. Nowadays, its practical role is to serve as a complement to some of the newer coin grading guides. Photograde is readily available from Amazon at a reasonable cost. "An essential reference for coin grading. Features more than 1,000 coin photographs, many enlarged to show important details to help you determine the grade of every series of U.S. coin in conditions from About Good to Proof 70. Includes dictionary of grading terms and more. 224 pages softbound." Every major type of United States coin, beginning in 1793, the first year of regular production, continuing through the 1950s, is represented in Photograde. Circulated conditions, ranging from About Good (AG-3) to About Uncirculated (AU-50) are photographed for every coin type, both obverse and reverse. State-of-the-art technology was employed at the time the photos were taken, but this falls considerably short of our capabilities today. Helpful descriptions, specific to coin type, accompany every photo pair. Chapter 1 adeptly defines the concept of coin grading, encompassing numerical grades and other important considerations. Chapters 2 and 3 relate the evolution of coin grading and the advent of the commercial grading services. A number of characteristics act as modifiers to a coin's grade. Ruddy covers these aspects in moderate detail. Coloration, toning, sharpness, and aesthetic appeal are just a few of the topics raised in this regard. No photos on MS Uncirculated coins. That is to say, an important segment of today's coin market is omitted from the core content of Photograde. There is scant treatment of Proof coins. The usefulness of Photograde, then, is relegated to the grading of coins in worn condition. The promo material indicates the book helps determine grade up to Proof-70. Perhaps I'm overlooking something, but as I browse through my copy, I can't find anything of substance to help me grade anything beyond the 60 point level. To close out the book, Ruddy dispenses advice on the handling, storing, displaying, and retoning of coins. There's enough information, albeit just barely, for the reader to become somewhat familiar with these issues. There are a few coin grading books in print today that clearly outshine Photograde. There are quite a few USED editions of Photograde available at Amazon, so if you can pick up one for a few bucks, go for it That's what I did. 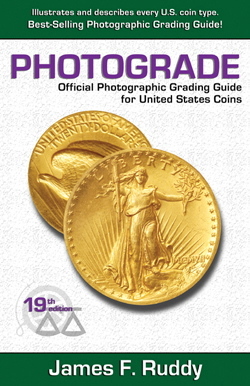 Photograde should NOT be your primary reference to coin grading, but as a sidekick publication, used intermittently within the boundaries of circulated coinage, it merits an OK.
Table of Contents announces 13 chapters. The chapter titles are descriptive, with good sub-headings to help understand the book's content. The book's structure is designed well enough to function as a quick reference guide. The quality of the black and white photos is only "so-so", when compared to our capabilities today. To be fair, the images in Photograde are indeed helpful, and the accompanying descriptions are instructive. That's why that after all these years, copies of Photograde are still flying off the shelves. Other than the coin photos, there are very few other visual aids. This makes it more difficult to conceptualize some of the advisory points (e.g. how to handle a coin), plus it's sorta boring to read. Remarkable reference on coin grading. All crucial aspects of determining a coin's grade are explored, presented in clear and concise language. Nearly half of the book is consumed describing vital information for grading individual series of US coins. Official Guide to Coin Grading and Counterfeit Detection also provides tips on how to spot fakes. The overall rating is held back, due to a large number of black and white photos that fail to adequately spotlight the imperfections pointed out by the authors. Still, we believe this is the most valuable book available today on the topic of coin grading, well worth the NEW price of under $10 at Amazon . "This is the second edition of an indispensable reference work for all numismatists. Included in this work are precise descriptions and digital images of grading standards used by PCGS (Professional Coin Grading Service) graders. Each series of US coins is described in detail. Also included is an all-new section on grading the U.S. State Quarters. 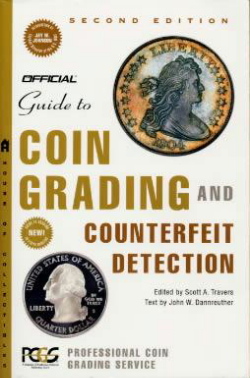 Other chapters provide the fundamentals of counterfeit detection and side-by-side comparisons of oft-faked coins. Tips for handling and storing your collection, and recognizing "doctored" coins fill other chapters. 416 pages, softbound." The Professional Coin Grading Service (PCGS) assembled the numismatic grading experts required to produce Official Guide to Coin Grading and Counterfeit Detection. It is indeed a marvelous work. In 1986, PCGS was one of the first (some will say THE first) to pioneer the concept of a third party (i.e. neither a buyer or seller of coins) grading service. That they remain in business today at the pinnacle of the coin grading business bears strong witness to the credibility of Official Guide to Coin Grading and Counterfeit Detection. The primary objective of Official Guide to Coin Grading and Counterfeit Detection is to publish a detailed account of coin grading standards. The process of grading a coin and the techniques and nuances employed in doing so are demystified. Also, strong emphasis placed on spotting phony coins (counterfeits, alterations, etc.). The attributes of coin grading -- marks, luster, strike, toning, and eye appeal -- and other factors are introduced superficially in Chapter 1. Subsequent chapters go on to closely examine these attributes. Every conceivable term associated with the art (or science?) of coin grading is explained in clear, concise language. The steps a coin passes through upon entering the PCGS grading process are detailed. The universally respected PCGS grading standards, based on the traditional 70 point scale, are outlined. For instance, the differences between an MS-63 and MS-64 coins are spelled out, in terms of marks, strike, luster, and eye appeal. In one of many achievements, Official Guide to Coin Grading and Counterfeit Detection lifts the fog on one point differences separating Mint State coins. Unfortunately, not many good photos accompany the excellent written descriptions, and many of those that do fail to demonstrate the conditions the PCGS authors are attempting to call attention to. Good photos are central to the content of grading manuals, and because Official Guide to Coin Grading and Counterfeit Detection stumbles somewhat here, we can't award a Five-Star Content rating to this otherwise deserving reference. For instance, the photos on page 12, presented to illustrate the result of toning, do very little to convey the message The photos accompanying the grading standard descriptions (especially the Mint State stuff) are only marginally helpful. Very fine section describing the various elements entering into a coin's grade, and how these elements arrive at a composite score. The interrelationship of these factors are complicated, but Official Guide to Coin Grading and Counterfeit Detection does a superb job dissecting each component, evaluating their impact on overall grade. Very comprehensive, but not tedious or boring. The heartbeat of the book is the grading guidelines for individual coin series, from half cents through double eagles and commemoratives. This includes an all-new section on the 50 state quarter program. The framework for the guidelines are expressed in terms of wear characteristics for circulated coins, and for Mint State examples, the familiar marks, luster, strike, and eye appeal come into play. Things to be on the watch for while grading Proofs are likewise presented. This portion of the book is comprised of 200 pages (about 48% of the entire book). Every coin type and metallic composition require unique approaches to grading, and Official Guide to Coin Grading and Counterfeit Detection does the best job I've ever seen to describe all these crucial grade determinants. Many years of valuable grading experience are condensed into the pages of this book. The book is topped off by an 86 page section instructing readers on how to recognize counterfeits and alterations. All the old tricks are laid bare, exposed for all to see through magnified photos of genuine and fake coins. Here, the photos achieve their intended effect. Little escapes the gaze of PCGS experts. Since the first edition of Official Guide to Coin Grading and Counterfeit Detection was published in 1997, the book has risen to become one of the most consulted numismatic references in the world (to wit, the relatively high ranking on Amazon). The second edition, published in 2004, is basically a compact retooling effort of the first, to facilitate ease of transportation (as in coin shows). After sifting through the pages of the ANA's copy of Official Guide to Coin Grading and Counterfeit Detection, I decided this is one publication worthy of inclusion in my personal numismatic library. The book's promoters boast that if a coin collector can afford to purchase only one numismatic publication, then this should be it. Given the criticality of grading and the high value of Official Guide to Coin Grading and Counterfeit Detection, this claim has some validity. The Table of Contents specifies the book's contents concisely and effectively. Descriptive chapter titles with sub headings allow the reader to spend only a minute or two to reasonably comprehend the breadth of the material. The Index is equally useful. Two print columns per page. Topics easily demarcated by larger, bold headings. You won't get cross-eyed when you dive into this book. A 16 page center section, printed on glossy coated paper stock, displays excellent color photos. Some of the photos were taken under high magnification, utilizing superimposed arrows to highlight described imperfections. These are highly conducive to understanding the techniques of coin grading experts. Official Guide to Coin Grading and Counterfeit Detection would have earned a Five-Star SPR rating had more photos of this quality been included. Overall the Style, Presentation, and Readability of Official Guide to Coin Grading and Counterfeit Detection rate very high. It is a superbly crafted reference.